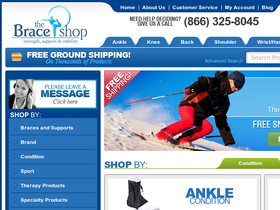 If you have some painful conditions with your muscles and joints and are in need of some support and stability then the Brace shop, online at braceshop.com, is the store for you. BraceShop offers a huge selection of braces for almost any spot on the body necessary. Find braces for the ankle, knee, wrist, back, shoulder, hand, head, neck, foot, and elbow. BraceShop is committed to providing their customers with the satisfaction they need and they offer top brace brands. Among these brands find Optec, Mueller, Ossur, ProBand, Active Wrap, Trulife, Medline and so many more. Even find a selection of walking aids including scooters, crutches, and wheelchairs. So when in need of a brace be sure to stop by The Brace Shop to see what they have for you. But first remember to swing by RetailSteal to find the best BraceShop promotions, BraceShop discounts, and Braceshop coupon codes. BraceShop offers free standard shipping on all orders over $100. Among the shipping options that Braceshop has there is Standard, Rush Delivery, and Overnight Delivery. Braceshop will ship internationally. See site for full details, exclusions may apply. Use this coupon code on Braceshop.com to save 10% on your entire order. Click to save. Shop the sale items at BraceShop.com to find up to 80% savings on select braces. Click to start saving. Enjoy a 5% discount on your order from Braceshop.com when you enter this coupon code at checkout. Click to save. Visit Braceshop.com and enjoy free shipping with your purchase of $49 or more. Click to save. Enjoy $10 off your next Braceshop.com purchase when you sign-up for the email newsletter! Enjoy $5 savings on any order of $100 or more from Braceshop when you use this coupon code. Click to save. Go to the Braceshop.com for savings up to 75% and team discounts. Click here for Back to School savings. Save $10 and receive free shipping on your Braceshop.com purchase of $100+ when you enter this promotional code at checkout! Save $5 on your Braceshop.com purchase when you enter this coupon code at checkout! Offer valid on orders of $50 or more. Shop at Braceshop.com and enjoy 5% savings on any order. Click here for code.